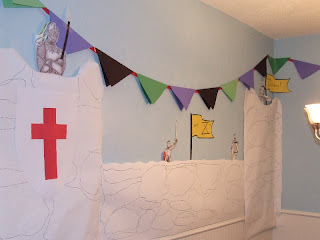 This year's theme for the newly turned ten year old's birthday was "Knights" so we started by turning one wall into a castle wall and added knights, flags and banners for decoration. The cake was a hit with the kids, but a disappointment in my mind. Maybe my standards are too high, but I like a cake to be nicely decorated and taste good. I wanted to build a castle out of cake pieces and frosting, but a weekend full of out-of-state guests and family gatherings made me rethink those grand plans. The Professor was with me when I found this pan and was instantly entranced. Seeing this as an opportunity to save some time and add to my ever growing cake pan collection, I bought the pan, brought it home and greased it up. 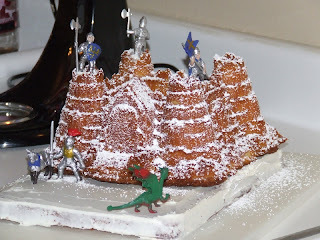 The children were impressed with the final results although the youngest was disturbed to see his little knights on top of this flaming treat that was about to be eaten, but he calmed down when the Daddy Fire Department rescued them. As a (totally non-professional, just for fun) cake maker, I am not sure I can give this pan two thumbs up. In order to preserve the details of the pan, you have to use a pound cake recipe or some other kind of cake recipe that produces a very solid crust. An odd shaped pan means odd shaped slicing and a thick crust becomes a tough crust very easily. Maybe I just need to play around with this pan using different recipes. The lack of frosting was also a disappointment although ice cream helped the situation. All in all, if you are looking for a visually interesting cake and don't care that much about the texture or taste, then the Castle Cake Pan will do the trick. 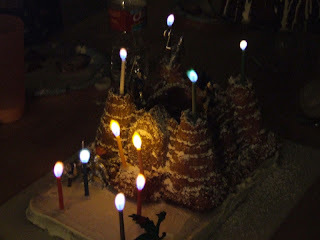 Oh, and the last picture didn't turn out great, but it was supposed to show off the candles that The Professor picked. The flames were the same color as the candle. Very cool! Well, it looks fantastic! I am so impressed! Can I come have a birthday at your house??? What fun, happiest b-day wishes to the big knight! Looks like Sir Tenyears (or is it Sir Decade?) had a wonderful party! I suspect his parents had a little fun making that castle, too. Very cool! Which recipe did you end up using? I bet the Better Than Everything Cake would work in there! Absolutely! When can I expect you and what theme would you choose? I love "Sir Tenyears". I wish I had thought of it yesterday. The castle was great fun. He wanted a plain vanilla cake so I used a basic pound cake recipe. I might have to try your recipe just for fun.